This is a two-part report. Link to part II at bottom of page. This visit to Chile was my fourth tour of its vineyards in seven years, but that made it no less exciting. For classic European wine regions seven years is but the blink of an eye: the boundaries of their wine industries – both physical and philosophical – were laid down centuries ago, but Chile has seen huge changes in that time. On my first visit in 2003, regions like Elqui and Limari, hundreds of kilometres north of existing vineyards, were unknown in wine terms. The first pioneers had broken ground and planted vines, but to all intents and purposes winemaking outside the Central Valleys simply did not exist. 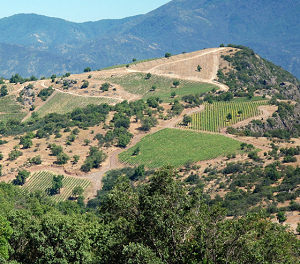 The expansion outward from long-settled areas like Colchagua, Maule and Maipo has been driven by many factors, but principally by winemakers’ desires to find cool climate zones where Pinot Noir, Sauvignon Blanc and Syrah could be added to the palette of Chilean stalwarts like Cabernet Sauvignon, Merlot, Carmenère and Chardonnay. The search for quality was another driving force. The Central Valleys – a fertile, agricultural paradise within easy reach of Santiago – had offered the path of least resistance to early vineyard owners. But whilst quality here could be excellent, newer vineyards moved west and closer to the coast, higher up the Andes to the east, north towards the Atacama desert or south into the forest country that borders Patagonia. None offered the easy option of the centre, but all held enormous potential. My journey started in the Elqui Valley, the northern frontier of commercial wine growing, and wound its way down through the valleys to finish in Bío Bío, not quite the southernmost wine growing region, but for now the most southerly region in commercial production. Before the detailed story of my journey, a brief introduction to Chile’s wine valleys, old and new. First planted in the late 1990s, a Sauvignon and Chardonnay paradise with a climate similar to Marlborough. Syrah and Pinot are noteworthy. No wineries as yet (just a few vineyards), but promising for Syrah and Cabernet Sauvignon. Until a decade ago the northern limit. Vineyards are expanding towards the coast, but the hot, dry interior remains a red wine stronghold. 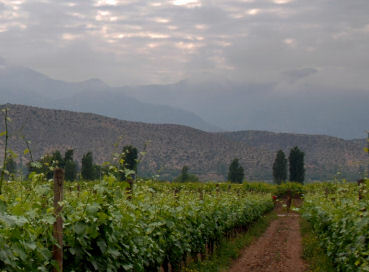 Maipo’s vineyards begin in Santiago’s suburbs and were some of the earliest to be planted. Fast developing is the cooler ‘Coastal Maipo’. A byword for cool climate since 1982, new coastal upstarts have stolen some thunder. Casablanca’s cool, foggy climate gives a white wine advantage. The new kids on the coastal block since the late 90s, some vineyards almost touch the sea and cool-climate Syrah and Sauvignon Blanc excel. Together make up the Rapel Valley. Bordeaux variety and Carmenère country, but look out for other big reds including Syrah and Malbec. Torres’ arrival in the 70s helped Curicó gain its own identity, but both areas remain diverse (over 30 varieties in production), volume players. These are the most southerly commercial regions, with higher rainfall and cooler nights. Exciting for aromatic varieties, Chardonnay and Pinot Noir. It’s all about potential and risk here, with hopes for Chardonnay and Pinot for the future. This pushing of geographical boundaries and opening of new valleys is one of the most remarkable and obvious changes to the Chilean wine scene over the past decade. But it is by no means the only one. On my first visit in 2003, to see a vineyard on a slope was a very rare occurrence. Almost all vineyards were on the flat valley floors with their fertile soils. Engineers had laid out the blocks and irrigation systems on purely pragmatic lines (with little thought of soil types, aspect or varieties to be planted – ‘terroir’ in other words). Farmers then did the planting in the rich, bountiful dirt, with no notion of planting on the difficult, rocky slopes or trying to determine exactly what the soils would give. In the last few years, even in the long-established areas, Chile has been racing to better understand its soils and planting. ‘Calicatas’, inspections pits dug between vineyard rows, were unheard of previously but now they are everywhere as soils and roots are scrutinised. This photograph shows an immensely detailed soil profile map at Viña Leyda, drawn after sinking hundreds of bore holes and taking electro-magnetic readings. It is typical of the research going on at many vineyard sites to better understand soils and, crucially, what varieties to plant in them. At Luis Felipe Edwards in Colchagua I travelled in a bumpy 4×4 up through the tree line to 900 metres above the valley floor. Here, agronomist Eugenio Cox and commercial director Nicholas Bizzarri showed their new plantings of Cabernet Sauvignon, Syrah and Petit Sirah, as well as bush vine Grenache, Mourvèdre and Carmenère. An enormous amount of work was needed to reach the tops of these hills then clear them of the thick bush visible in the foreground, even before preparation for planting could begin. 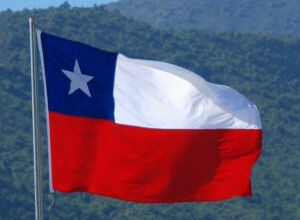 The costs and labour involved are huge, but show Chile’s determination to build on their reputation for high quality and consistency, and reach – quite literally – for something on an even higher plane. Change is everywhere. In a country I had always regarded as being rather traditional and serious, and because of that not willing to take too many risks. New regions, new ideas and new varieties abound. The nervous, highly strung whites of Elqui, the vivacious Sauvignons or Leyda or the lush Pinots of Bío Bío join increasingly sophisticated wines from established regions. If Chile’s reputation of being safe, reliable, but somewhat unexciting was deserved, then stand by for seismic shocks over coming years. The evidence of my most recent visit shows a wine industry that is as multi-faceted and ambitious as any. Many people had told me of Elqui’s special magic. This remote, ravine-like valley enjoys 320 absolutely cloudless days and nights per year, with one of the cleanest, purest atmospheres on earth. That means solar radiation is around 10 times stronger than in Europe, and ever surface seems to glisten in almost other-worldly brightness. 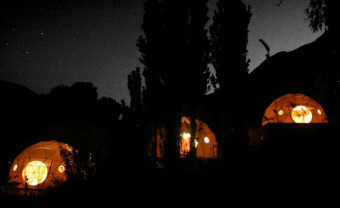 It also means the valley is home to eight major international observatories and indeed, I spent a night in Elqui Domus (right), an observatory hotel with open roofed bedrooms and telescopes for guests. Rarely have I felt such a connection between a place and its wines as I have in Elqui. The property of the light, the luminous sky and the dazzling freshness of the air seems to be hewn from the same cosmic dust as the pristine, razor sharp wines. A major producer of Papayas and grapes for Pisco, life in Elqui is crammed into the narrow valley floor between towering, barren hills here on the southern edge of the Atacama desert (click photo for larger version).Some of those vines for Pisco, including Pedro Ximenez, are now used to make table wines, but it is new plantings including Syrah, Sauvignon Blanc, Carmenère and Chardonnay, especially higher on the slopes, that are causing most excitement. Grapes for wine production date back only to 1999 here, so the potential is enormous. Even though daytime summer temperatures can reach the mid-30s, the thermometer plummets at night under the clear desert skies. All of this influences the mineral, taut, racy wines. But then is it so farfetched to think something of the valley’s magic does too? Hippies and crystal obsessed new agers have colonised Elqui since the 60s, drawn here by a belief that the valley exerted a strange magnetic energy. Since then, scientists measured Earth’s magnetic forces for the first time using satellites. And what did they find? The earth’s greatest source of energy is in South America – centred on the Elqui Valley. 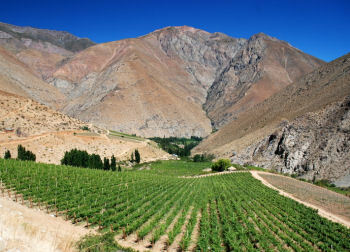 Pioneers in Elqui, this family company with a winery in the valley farms on old river beds and high in the mountains. Farming organically on some extraordinarily high Andes vineyards at 1950 metres, where winter brings a covering of snow 20cm deep. The San Pedro company has 80 hectares in Elqui and is planting steadily, including Riesling and the area’s first Pinot. Elqui does not have magic all to itself in Chile. Here in Limari, ancient civilisations have left their mark. On part of Viña Tabalí’s land lies The Enchanted Valley national monument, home 2,200 years ago to the El Molle hunter-gatherers and a place of sacrifice and ritual. 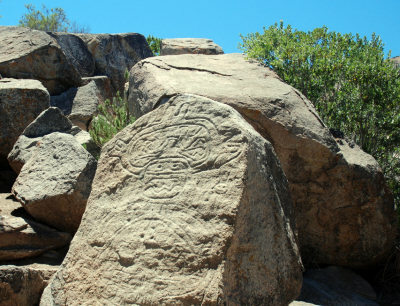 Now an open-air museum, there are examples of pictographs, petroglyphs and piedras tacitas, mysterious formations of cups carved into the rocks, with many theories about their use. The picture on the stone, right, shows the carving used by Viña Tabalí’s as its logo. Limari lies 400 kilometres north of Santiago. It is a cool climate area, but unusually, it is also very dry. Other cool, coastal areas like Casablanca have 400mm of rain per year, whilst Limari sees only 70mm. As all of that falls in winter, there is no risk to the harvest. Winemakers here told me they saw no evidence of climate change affecting this – so far. Limari is relatively close to the Pacific ocean too (with new plantings moving nearer and nearer), and the sea temperature in high summer remains around only 10 – 12ºC, because of the Humboldt current sweeping up from the Antarctic. It is also a windy area, with almost constant breezes. Wind farms are now becoming a common sight, with a stiff breeze rising like clockwork around noon and blowing all afternoon. All of these factors combine to create a cool climate zone, but one with a long, dry growing season where sunlight intensity is great. This allows the production of high quality red wines, even in such a cool region, so Limari’s strengths include Syrah, Carmenère, Merlot and some Pinot Noir – even Cabernet Sauvignon. Exploring the most westerly reaches of Limari only 12 kilometres from the coast, a vast array of possibilities opens up. From their fruit farming beginnings, Tamaya were Limari’s pioneers in the late 1990s, when their first vines were planted. The drive is on to better understand the differences between Chile’s wine regions and the qualities that make them distinct. These regional characters will be used not only to shape the future for wine in these regions, but to market the wines to the world. 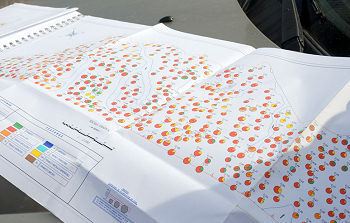 For winemakers this means understanding their terroir and, quite naturally, a search to identify not only what is unique about their region, but about their specific vineyard sites. This new focus on geography and geology is also causing many to question the relatively large demarcated zones in Chile, and whether a finer-grained map needs to be drawn. Here in Aconcagua, recognised as a hot, red wine area, there is speculation that the region could be redefined as at least two, if not three new appellations. Owner of Viña San Esteban, Horacio Vicente, tells me he would be happy to be considered as part of a ‘Mountain Aconcagua’ appellation, just as others will fall in a ‘Coastal Aconcagua’ zone. But for every winner there could potentially be losers, and some cool central sites could find themselves lumped into a less rarefied appellation simply because of geography. Similar debates are raging in most of the established Central Valleys, perhaps as a reaction to new ’boutique’ regions like Leyda and Limari that have stolen some of the limelight. Right: San Esteban’s vineyards (click photo for larger version). Dominated by Mt Aconcagua at 6,962 metres and sitting at an altitude of around 900 metres, the Aconcagua Valley used to be the northern limit of Chilean vineyards before Limari and Elqui came along. 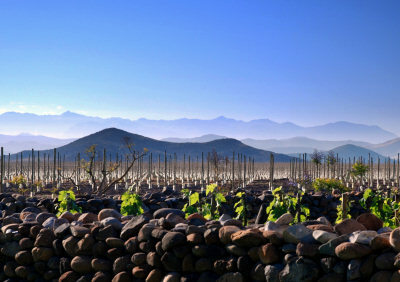 Vineyards follow the flow of the Aconcagua River from the Andes to the ocean, and as is so often the case, sea breezes cool the vineyards whilst Andes snow-melt irrigates them. But vineyards have been spreading out from the flat, fertile centre towards the mountains and the coast. This has uncovered cooler zones within Aconcagua, and has led to an improving reputation for cooler climate varietals like Syrah, and white varieties too. Having switched from bulk to bottled wine, San Estaban farms organically and rather likes to swim against the tide. 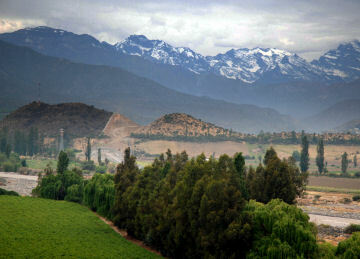 Daddy of Aconcagua, Errazuriz’s wines like Don Maximiano and Seña helped propel this Valley onto a world stage. The particular geographical position of Chile’s capital city Santiago – surrounded by semi-desert and practically ringed by high mountains – means it suffers from almost constant air pollution. Add the emissions from a crowded, modern city and although Santiago may sit hard against the Andes, a heavy haze often obscures the otherwise breath-taking views of the city against the mountain backdrop. Once into the largely agricultural valleys however, and brilliant blue skies and sunshine invariably break through. Except, that is, in the Casablanca Valley. Casablanca is a relatively new region, planted in the mid 1980s much closer to the coast than anything that had gone before it. The coastal influence on this Valley is powerful. The Humboldt Current is, as always, the main player bringing freezing cold water up the Chilean coast from the Antarctic. Morning fog and cloud rolls across the relatively low coastal mountains at this latitude, filling the valley with cooling mist that lingers heavily long into the morning. By the afternoon, sunshine burns through the cloud and fog, giving plenty of light and sufficient heat exposure to the vines. There is only a little danger from frost on the valley floor in the colder months, and with still relatively dry conditions, Casablanca’s potential for white wine was spotted early. Big players from other regions like Lapostolle and Errazuriz rushed to plant Chardonnay, Sauvignon Blanc and Riesling. Viña Casablanca was the first estate to base itself here in 1992. Today, other coastal, cool areas have muscled in the patch that Casablanca had all to itself for over a decade. San Antonio and Leyda, and coastal extensions to Aconcagua, Maipo and other Central Valleys also play the cool climate game. But the conditions in Casablanca, its long-established vines and it reputation remain intact. Part of the Santa Carolina group, pioneers here in Chile’s cool-climate wine valley and now planting Syrah. Also part of a larger group (VSPT), Viña Mar has an eye on even cooler sites if climate change continues to warm the Casablanca Valley. From their fruit farming beginnings, Tamaya were Limari pioneer in the 1990s when their first vines were planted.